This is Part 2 of our 2012 Blog Reader Survey results. Back in January, we asked our readers to participate in an annual online survey to find out the key issues impacting small membership organizations and what information we could offer in the Wild Apricot blog that might help. Thanks again to those who participated. Last week in Part 1, we covered survey response about our readers and why they follow our blog. You might be interested to note that those who answered this year’s survey were predominantly staff or volunteers at small membership organizations with fewer than 500 members or supporters. 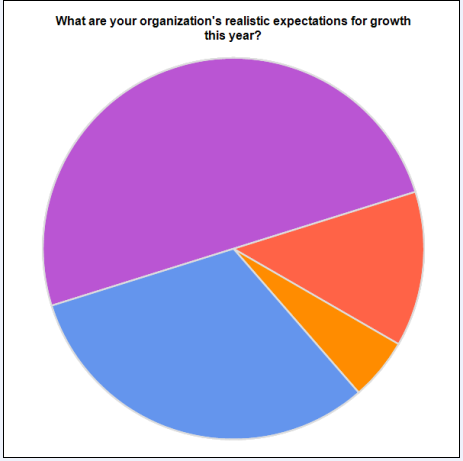 In this post, we’ll look at the issues facing membership organizations as well as: feedback about expectations for membership growth; the challenges organizations are facing; and communications channels being used to recruit and inform members. 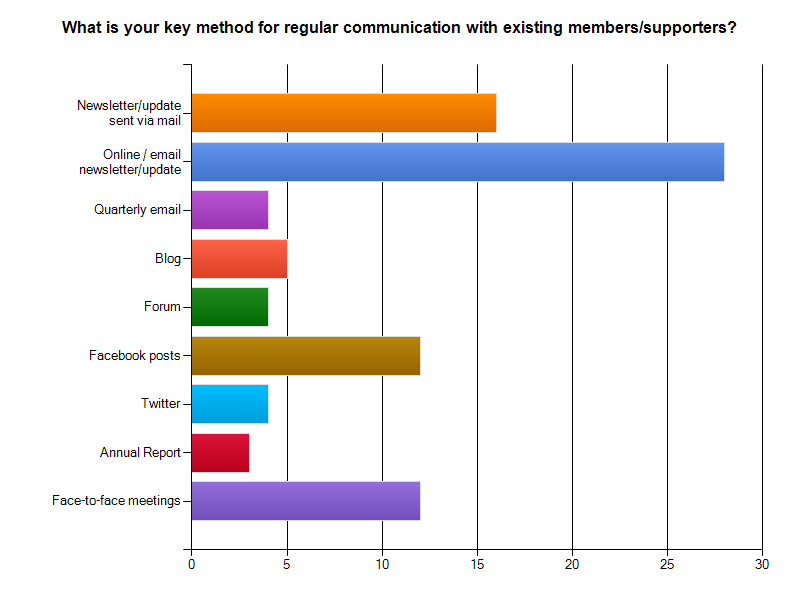 What issues are membership organizations facing? However, “membership retention” and “resource scarcity” ranked much higher than last year. And it seems that this year, “budget Issues” aren’t as much of a hot button item as they were in 2011. In addition, “volunteer recruitment and management” also seem to be less urgent issues for 2012. 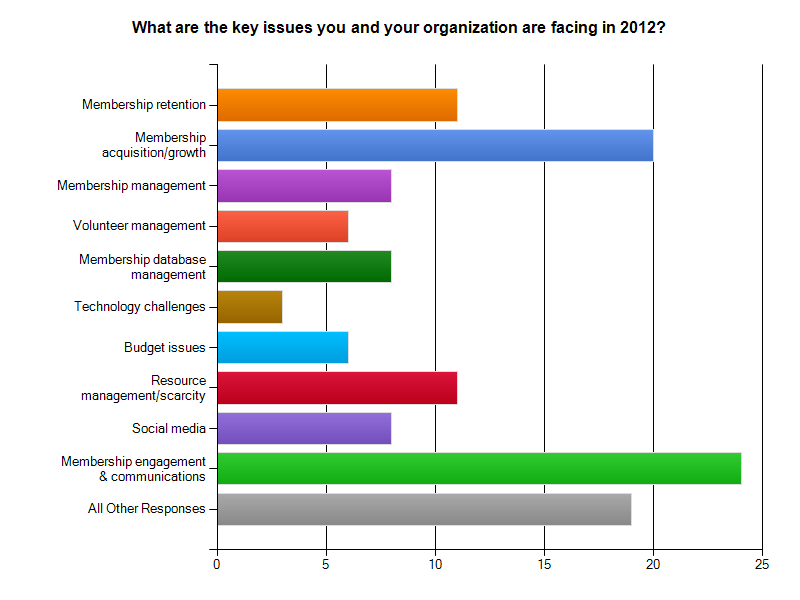 What are the key challenges affecting your membership growth? It was interesting to note that the economy – while still a consideration – was ranked as the least of the challenges noted by survey participants. While we fully expected “website” and “email” to be the top recruitment methods, the fact that almost all respondents also ranked “Word-of-mouth” as key stands to remind us of the importance that peer interaction and recommendations continue to play for membership organizations. When it comes to the “method for regular communication with existing members/supporters”, “online or email newsletters or updates” continue to be the vehicle of choice, and it looks like good old “snail” mail is also still popular for membership outreach. 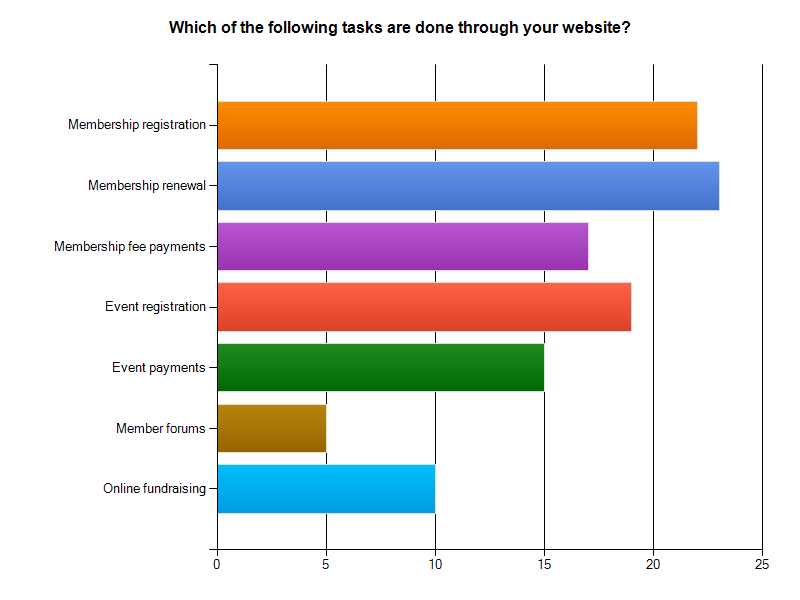 To find out the levels of automation of membership functions, we asked: “Which of the following tasks are done through your website?” Not surprisingly, membership registration, renewal and payment topped the list, followed by event registration and payments. We also wanted to “take the pulse” of membership organizations around the type and frequency of events they plan to hold in 2012. 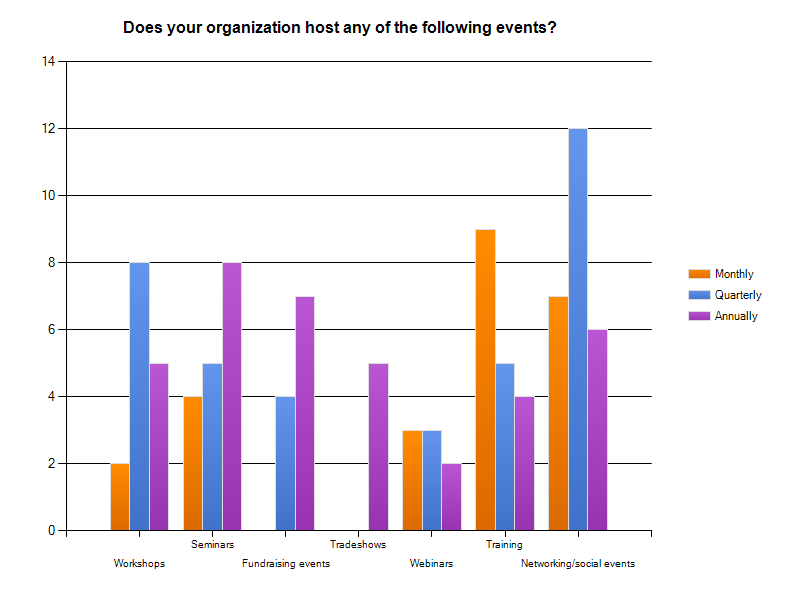 From the feedback on the survey, it looks like events remain a key offering for most of the membership organizations who responded. As we’ve noted in past posts, online surveys can be a great way to poll your members to get their feedback in order to prioritize goals or services. We plan to use the information we gathered through this Blog Reader Survey to develop content for both this blog as well as our Membership Knowledge Hub (articles and guides and other resources for small membership organizations). So thanks for your feedback and stay tuned to this blog for posts on the topics you identified. Interesting to see that social media is epected to have a smaller inpact on new member than WOM, email and the website. I had guessed emails were not that good for attracting new supporters, and Social media is the biggest WOM spreader online atleast. Johan: Our survey results indicated that WOM is still effective for those orgs that responded. However, each organization needs to determine what would work best with their members' or supporters.